"...are you a boy or a girl?" Apparently I'm 74% like a man. It's OK though, the other 27% is entirely comprised of kittens, chocolate, wild mood swings and an inability to tell left from right or do maths. It's not that I've got strong feelings either way about the guy, but I was saying* just a couple of weeks ago at the open mic that today's sensitive young people need to put away their NickDrake/JeffBuckley/JohnMartyn CD's for a while and listen to some Buzzcocks instead. Or perhaps three and a half minutes of The Wedding Present. Or maybe even go outside and kick a football about for a bit. The much derided 'Away Day' has been cancelled. Well, that's the rumour anyway. We were going to get an email about it, but the Senior Management Team couldn't figure out how to send the email. Well, that's the rumour anyway. 'The current financial climate' is the reason (according to the rumour). Although how much worse the climate has become since last Friday lunchtime - when we were all made aware of the travel arrangements, and reminded, once again, that leave would only be sanctioned under the most extreme circumstances - has not yet been made clear. All will come to light in due course, no doubt. Personally, I'm gutted. I had my strategy ready and my pencil sharpened. "...as I was going over the Cork and Kerry mountains"
The chap hauling a tan coloured suitcase of the type you don't really see anymore up the steps of the Pendoino has a dissolute appearance; sallow skin, bleary eyes, and dishevelled hair. The cord jacket has seen better days too. Something shakes loose in my memory and I think of the first college boy I made myself miserable over. He was dishevelled and bleary-eyed, with a cord jacket and a set of matching luggage stowed away on top of his wardrobe. I moped over, on or around him for five months. Then stopped. He was the sort who would either not have made it through his twenties or be running an empire by now. Or be struggling, with an overstuffed suitcase, on the steps of the Pendolino on a cold January morning after a series of unnecessary business meetings hastily arranged to facilitate an unsatisfactory Travel Lodge liaison with a woman he met on the Internet. Thirty four minutes part one and everything has come to a standstill because of the beautiful big feathers of fluffy snow spiralling in slow motion towards the street. They say it won’t last, it can't stick. And I sort of hope they’re right, because if it does the trains will be fucked for sure. But right here – right now – it’s enough that, as I look up, everything slows down. Two things I hope I never grow out of. This morning was great. I got up at half six and did thirty minutes on the exercise bike. It removed all the guilt from the rest of the day. Then I remembered: today I’ve been at my job for exactly ten years. It’s far too long, but it’s far too late to leave. So, this is it – the acrimonious meetings, the dissembling, the back peddling, the lambs to the slaughter, the wolves in sheep’s clothing – I’m not complaining, I must make that clear. I’m accepting how it is – there’s no point trying to change it, working to make it better or hoping it’ll come out right eventually. Any improvements we do achieve will be purely coincidental and in spite, not because, of the 'SMT'. However, I reserve the right to continue to be ‘outraged’ at the inefficiency and ineptitude, to still laugh at the idiocy and gasp at the rumour that the much derided ‘Away Day’ lined up for March, will set the service back the annual salary of a minion such as myself. The food better be good. Oh no. I think The Wire has ruined ER for me. Maybe its true that The Wire ruins all TV for ever? Or maybe ER just got really bad. "...instead I'm just the flower girl, dropping petals all through this empty world"
A problem with these Virgin trains is that once you've got settled in your seat you can't really see anyone else – especially when it's quiet and you’re right down at the far end where no one even needs to walk past. So, if no one else will occupy my time for me, what's left for a girl to do but sit and think? On top of that it’s exactly the gloomy, drizzly, chilly type of day that sets a person up for fifteen minutes of pointless introspection as they’re hurtling down the track. I assume a suitably melancholy expression and wait pensively for the thoughts to arrive. Not much happens. I try a bit harder. Tulketh Mill glides by, then the University. Still nothing, and we're already being advised on how to open the doors and safely descend to the platform. The other problem with these Virgin trains is that fifteen minutes doesn't really give you long enough to get properly introspective about anything. Why are my toes bleeding?" The undeniably attention grabbing opening gambit from letter of complaint concerning the poor quality of the modern nail scissor. "So, what are you up to this afternoon?" "I'm taking a cows head to Burscough"
Some of the duties of some of my colleagues puzzle me, even after all this time. ... ... ... and NOT this amateurish, Poorly Composed, Wrong Sized Font and Misspelled, Childish Junk! Extract from an email we initially assumed was directed at us from yet another disaffected consumer, so low is our collective self-esteem. Turned out we'd been cc'd into a rant against money laundering spammers. Did I mention those improved services? Oh yes. They really are worth paying for. At least I manage to get a seat. Others don't. The Quiet Coach is very quiet, but smells horribly of dog. These two facts may be related. Four school boys, walking abreast, down the middle of the street. The terraces spreading out, up and over the hill behind them, like an alternative opening scene for 'The History Boys'. How I love the new train fares and the improved service they bring. The cheeky scamp sits down alongside the pretty blonde and says: "Do you want to see my draught excluder?" I'm almost certain they were previously acquainted. "...so many faces in and out of my life, some will last, some will just be now and then"
I dreamt about M last night. It must be fifteen years or more since I last saw her. She just sort of disappeared. Dropped off the edge. There have been reports and rumours – but no confirmed sightings and no real explanation. Last night I dreamt J & I were visiting R. It was summer: late but still light, and warm, and quiet. We were in the field, waiting, although it wasn’t clear what for. Then M arrived. Looking exactly the same as the last time, when she’d just returned from the Turkish Adventure. There was a lot of hugging and crying, which is strange as we don’t do hugging and crying. Everyone was happy though. Yoga last night was fierce. Extreme yoga. No doubt. Appropriate to the Season we were cleansing our livers. "Listen to your body", she says "breathe through the discomfort", "It’s all in the mind" and "You’ll feel great tomorrow". By lunchtime today I could hardly walk upstairs. She also has a habit of saying "You’re all doing very well", which inevitably un-focuses me from the third eye and regrettably replaces the mantra with "ground floor perfumery, stationery and leather goods, wigs and haberdashery, kitchenware and food…." I need a hot bath, but the train gets later and later until eventually the later train (which is also becoming later, but more slowly) arrives sooner. Pasties and a G String - Tom Waits : I mean, it’s obvious now ... now, with the envelope open ... who else could this be but Tom Waits? Listen to the lyrics! Hear the voice! Ahem... Anyway, I think this is a brave opening track, no concessions are being made here, it makes me think Alan is a 'what you see is what you get, take it or leave it' kind of chap. Even now, many several plays later, I'm thinking I'm not quite ready for Tom Waits songs which haven't been filtered through other performers first. I'll keep at it though. Let Robeson Sing - Manic Street Preachers : At least I recognise the artist this time. From the intro my head is expecting the track to turn into ‘Wishin’ & Hopin’... It doesn't. I'm not a big fan of the Manics (which translates to 'know nothing apart from the singles, aren't they a bit over earnest?') but this is … listenable... I can see what they're going for, but it feels a bit 'by numbers'. They do mean well though don’t they? Chase the Devil - Eagles of Death Metal : I don't recognise this. During the first listen I wrote down: 'Hmm. Spoils the mood for me. Is it supposed to be funny? It’s a bit like listening to Mitch Benn. You think it’s finished - but it comes back! you wish it had finished. WAY too long'. This is one I haven’t changed my mind about, even after giving it ample opportunity and learning that it was put on as a deliberate attempt to provide a bit of light relief. Ne Me Quitte Pas - Regina Spektor : Phew. I can tell from the start that this is going to be getting things back on the rails. I really like this one. I don’t recognise the voice. I scribbled down ‘Quirky. Sounds a bit Fiesty.’ All I’ve heard of Regina Spektor until now is ‘You Don’t Know Me’ with Ben Folds. She’s probably got one of those ‘marmite’ voices, but I like it and it’s growing on me with every listen. Will need to check out more. Navajo - Black Lips : First chord sounds like Cinerama, then it breaks into The Coral - Dreaming of You. It’s similar in mood to the (what I know know to be) EoDM track, but I enjoy this one - not sure why yet. More fun? More tune? More pithy? I’d never heard of Black Lips, so naturally I Wikipedia’d them… don’t feel the need to get to know more, but wouldn’t avoid them. Except in real life, obviously. Always Crashing in the Same Car - David Bowie: I will own up. On the first run through I didn’t recognise David Bowie*. I’m not a huge admirer, but even so….It’s embarrassing isn’t it? Especially as I now know that, to Randomalan, Bowie is God. I had scrawled ‘retro Jarvis? quiet & a bit muffled - old technology?’ on my bit of paper. I keep trying to give it a proper listen, but find myself tuning out half way through. Last Stop: This Town - Eels : Ah, now, here's one I get to recognise instantly! Even people who don’t like Eels can like this. Electro-Shock Blues is probably my favourite Eels album, I know it has some dark songs on it, but I’ve never found it miserable or depressing. Trouble is, it’s quite hard to listen to something familiar and have an objective opinion on it…it’s ‘Last Stop This Town’ - what more can I say! Werewolves of London - Warren Zevon: A-hoooo !!! Another favourite…"littleoldladygot mutilatedlatelastnight…" "his hair was perfect" etc. I think it's actually illegal to dislike this song. Intervention - Arcade Fire: Three in a row for the tunes that I know! There are people who don’t ‘get’ Arcade Fire, but it’s more surprising to me that so many people do. I couldn’t believe they were selling out Arenas last year. I think they stay the right side of self indulgent and carry off the bombast. This is probably the 'biggest' song on the CD and comes in at just about the perfect point. This Side of the Blue - Joanna Newsom: Now, here’s where the blind testing comes into it’s own - I had scribbled down ‘American Stina Nordenstam?’ and enjoyed this track - even though my previous attempt at listening to Joanna Newsom ended badly, I really couldn't bear her voice, 'cats in a sack' and all that…maybe I need to go back and try again, because this isn‘t half bad. Still haven't worked out what's going on in it lyrically, so am not likely to get bored with it any time soon. John Allyn Smith Sails - Okkervil River: Ah, this is a surprise, it's ‘the one that turns into Sloop John B’. Which is probably better than thinking of it as ‘the suicide song’, because it doesn't sound like a suicide song. Are Okkervil River an 'if you liked Eels you may also enjoy...' band? I Wish I Never Saw The Sunshine - Beth Orton: [I didn't recognise this during the blind test, but we were sitting down and eating the tea by now, and Tim identified it for me] Beth Orton is someone else I don’t know that much about but feel I should - although not as a result of this song, the only one on the compilation that has paled with repeated listening. 'Plaintive', if I’m being kind, 'dreary' if I’m not and, in this company, it sounds very ordinary. Disturbance at the Heron House - REM: Well, it’s REM and no mistake, but I don’t know the track and it doesn’t especially grab me. When I investigate I’m surprised to discover it’s such an early one (it's from 'Document') I can hear the lyrics apart from anything else. I don't dislike it at all, but it hasn’t grown on me since the first listen. Maybe I’m over-familiar with too much REM? Tunic (Song for Karen) - Sonic Youth: The ’blind’ reaction: 'sounds like Stereolab? Scary!!!'. Sonic Youth are yet another band I know nothing about, other than to assume I wouldn't much like them…but, but, but, I do like the sound of this. It's very lulling. Simultaneously cheesy & creepy especially the spoken vocal - or is that the point? It’s about Karen Carpenter you know. More death. Put me off my tea a bit. But in a good way. So there it is, I seem to have reviewed my Shuffleathon CD without managing to describe what any of the tracks actually sound like. Maybe I'll try again tomorrow? Maybe I'll do better next year - if I'm allowed the chance. Thank you very much Randomalan - only one total shocker and four (previously unknown) runaway successes - not a bad return! However, the modern world is not all rubbish. And if that hadn't sufficiently warmed my cockles I'm pretty sure I just saw a goldcrest hopping about in the rosemary. 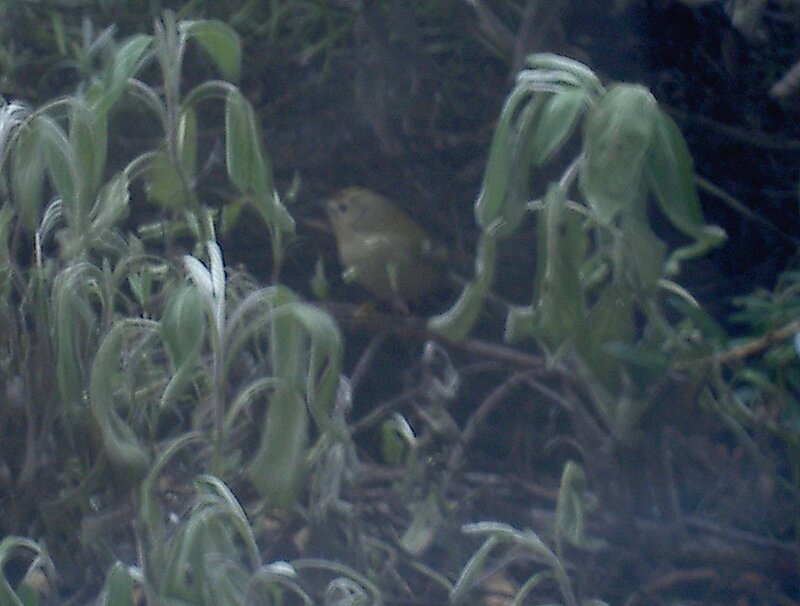 I've never knowingly seen a goldcrest before. Some years ago there used to be a programme on at around this time of year called 'Decisive Moments'. It was on Channel 4 I think, or maybe BBC2? It took a selection of extraordinary photographs from the previous twelve months, explained how the photographer came to take them and, consequently, the story behind each image. There don't seem to be 'end of year round-up' programmes like this anymore. It's all "2,000,008 Most Annoying People of 2008" or "The 21st Century's Most Shocking Celebrity Moments", (presumably featuring 'People We Couldn't Fit Into The Annoying Programme But Still Want To Be Snide About') or "Jools Holland's Weakest Hootenanny Line-Up Yet".